On a regular basis, I think a little cleaning every day is all you need to maintain a clean enough home. 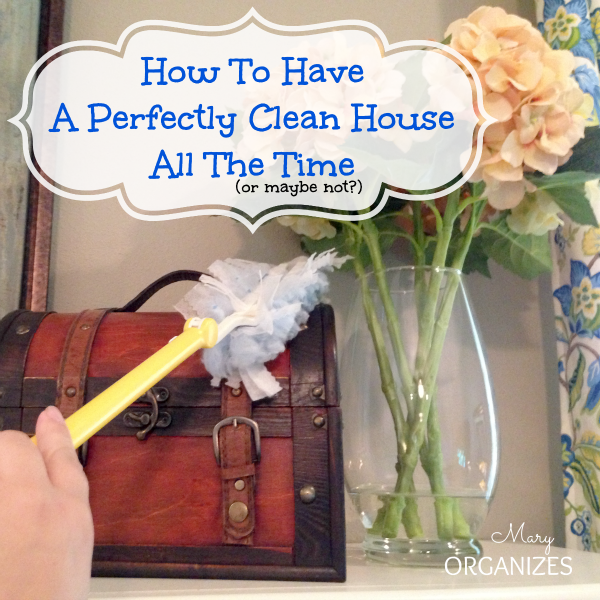 (READ HERE: How To Have A Perfectly Clean House All The Time… or something like that). But still, there are those times we want the house clean all at the same time, especially if guests are coming!!! I give you my best strategies below for cleaning your whole house in one, quick go. Remember, the goal here isn’t deep Spring cleaning – we are doing enough for our homes to feel clean and ready without going overboard. First of all, DIVIDE Tidying from Cleaning! Seriously, stop trying to do everything at once and make yourself dizzy. Separating these different tasks lets you work faster and more efficiently. Or, in other words, you get a lot more done in a lot less time. 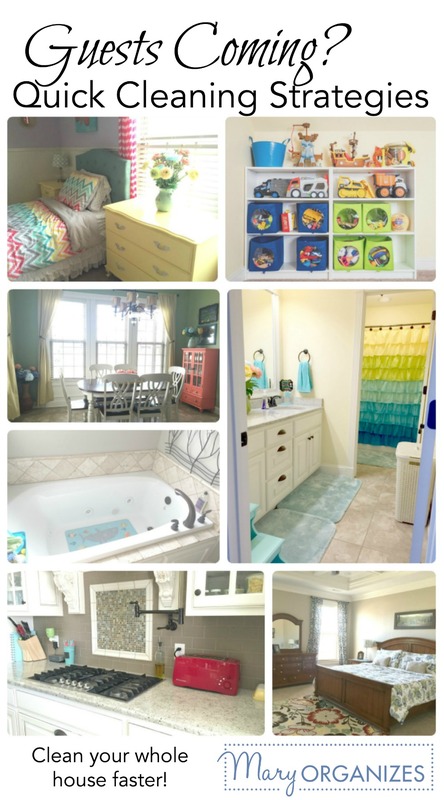 If you are keeping up with your daily Super Tidy (READ HERE: Super Tidy! ), then this step will take a lot less time. There is a reason I have these steps numbered. Following in a specific order keeps you on task and not spinning your wheels! Here is your strategy to tidy it all in a short amount of time. Play some music and get some cardio in – do not let yourself overthink it or get distracted into a different project. Just tidy. We are going to tidy in the same pattern we read Top to Bottom, Left to Right. Forcing yourself to work in this order helps to keep you focused and moving forward in a consistent direction. Grab a laundry basket and take it with you to the first room. Anything that doesn’t belong in that room goes in the laundry basket. Tidying in this circumstance is NOT decorating or re-organizing. Force yourself to focus on putting things where they go, not for cleaning or trying to create new places for everything. In the first room you work through, start tidying the highest surfaces first and work your way down to the floor. Once everything in that room is in its place and you’ve pulled out anything that doesn’t belong there, you’re done in that room. Leave the room and bring your basket of stuff with you. In each subsequent room, first go through the basket and pull out anything that belongs in that room. Then tidy that room from top to bottom. Put anything that doesn’t belong in that room in the basket. When you finish tidying your last room, take the basket to each room working the opposite order and put things away until the basket is empty. Now each room should be tidy and ready to be cleaned! The square footage of your space directly affects how long the cleaning phase will take you, but the tactics are the same. Now that you’ve already finished tidying, you can focus on the cleaning and just get ‘er done. If I want my whole house clean, I always start with the bathrooms because it makes such a huge difference right from the start. Spray the toilets with cleaner. Spray the bathtub and shower with cleaner. Wipe the sink, counter, and mirror. Do not use a wet cloth for any of this. Spray the cleaner onto the dry surface and wipe with a dry rag, otherwise you are just letting water spread germs for you and create dirty-looking water spots. Wipe down the bathtub and shower. Using a feather duster walk from one end of the house to the other (top to bottom, left to right) dusting as you go. 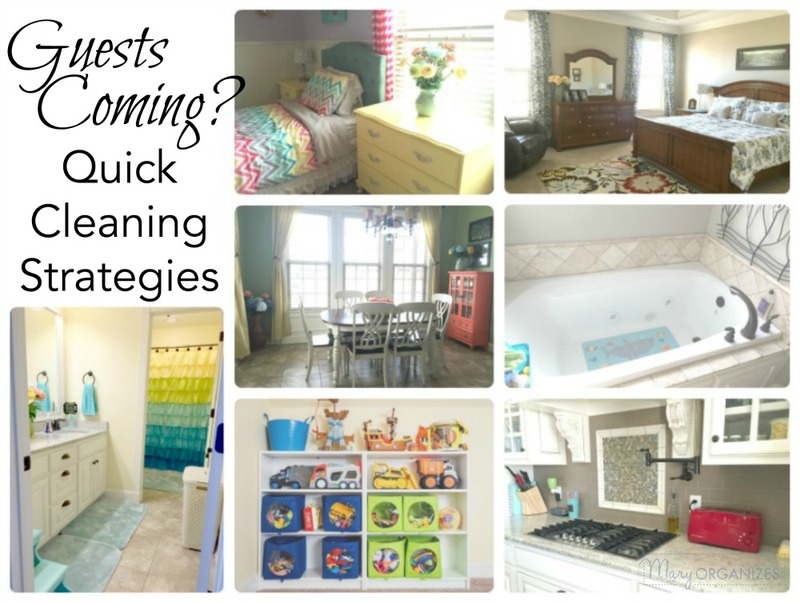 Save intricate dusting for other times because you are focusing on getting this house ready for your guests quickly. Now it is time to vacuum, you guessed it, from one end of the house to the other (top to bottom, left to right). I vacuum all surfaces – carpet, wood, and tile, even in bathrooms. Do your dishes and run the dishwasher. Wipe down counters, table, and appliances. Do a quick mop of the kitchen and bathrooms. I like to use a spray mop with the microfiber cloths on the bottom for these quick cleans. I use a steam mop on other cleaning days when I am only focusing on cleaning one specific place in the house. If I’m doing the whole house, I use faster and easier methods. Empty the trashes throughout. You’re done. I hope lots of guests are coming your way, because you’ll be ready!